Syed Zafar Mahmood , a renowned critic of Gujarat Chief Minister,Narendra Modi,presented a slide show at the Young Indian Leaders Conclave, touching upon various aspects of problems being faced by Muslims and the 2002 riots, in front of the Gujarat CM and said he was happy that his views were taken in stride. His presentation was to explain why is the Muslim Community of the country heavy-hearted with BJP and Modi. Modi assured to consider the issues presented. 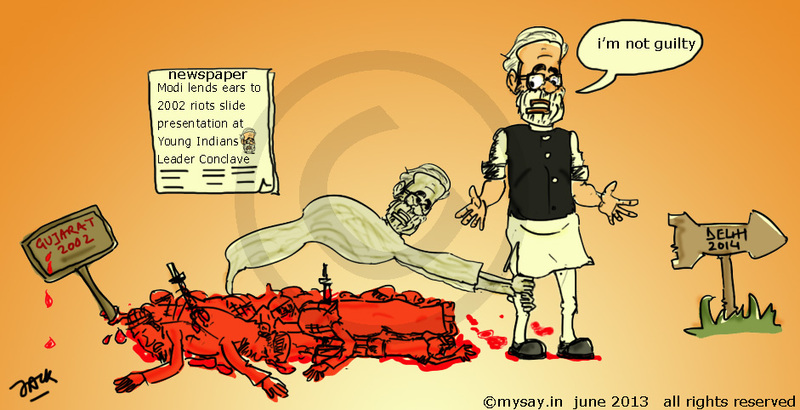 The ghost of 2002 Gujarat riots has haunted Modi since a decade now. And it is the same ghost which has become a major threat for him to even think about the Prime Ministerial post.Convincing the Muslim Community to ease themselves against him is the only way out. After all,the path to Delhi can never be set without the support of the major Minorities. Modi Has done his part in Gujarat 2002 riots and now he face the consequence and I really feel he is also not 100% secular…The recent example is where he only saved Gujarat people in Uttrakhand..
No one can get away from the ghosts from one’s past. Does it matter who he saved in Uttrakhand ? He saved and that’s that. Its better than the politicians who did not have the guts to go there and stuck to lame blame game statements on twitter and the likes. Btw Jack (mithun da), I simply love the cartoons, they get better everyday !! true life saved is important ! Good post. Anyway, I think Congress is just trying to pull down NaMo as he’s now a serious threat to their corrupted regime. Let’s see what happens. No, but Congress does want to divert public’s attention from their mind-boggling corruptions scandals of last 5 years as election draws near. Your post reminded me of an old Hindi film song sung by Lata Mangeshkar and Hemant kumar both but solo…the lyrics go like this…wo dastaan jo hamne kahi bhi hamne likhi bhi aaj wo khud se suni hai…. but I have noticed Modi dodging 2002 related questions everytime in media . Speaks for itself ! I somehow trust him … as a great prospect for India although .. I have seen him dodging 2002 questions !! Rest he behaves rational and talks upfront and sensible. I wish .. he would have kept a clean image ..2002 riots are the reason why the Minorities remain negative toward him and that is the difference between Atal ji and him. Even the minorities did not mind .. Atal ji as the PM ! do u know that was his pet dialogue ?